* For additional information, refer to the separate Navigation System Owner’s Manual regarding the Navigation system control buttons . 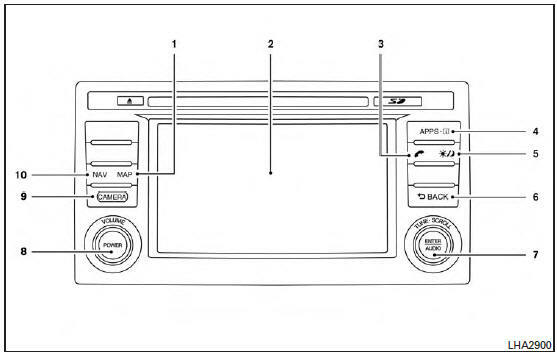 ** For additional information, refer to “Bluetooth® Hands-Free Phone System with Navigation System” in this section regarding the Bluetooth® Hands-Free Phone System control button. When you use this system, make sure the engine is running. “Example” — Words marked in quotes refer to a key shown only on the display. These keys can be selected by touching the screen.